Caption slip reads: "Photographer: Olmo. Date: 1958-07-18. Reporter: MacMillin. Assignment: Two pairs twin entrants in 17th annual Ladera Park Baby Show. 39/40: Twins Michael (left) and Joseph Rosauer, 12 months. (The boys didn't like being awakened for picture taking). 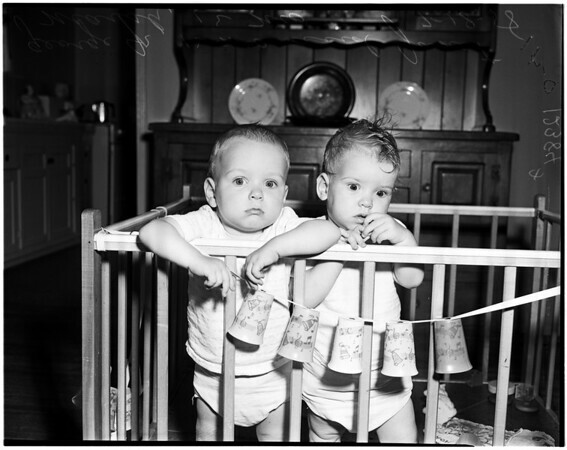 41/42/43: Twins George Jr. (the bald one) and Janet Marsh, 12 months".